I did not visit Cheek by Jowl at Boon Tat Street when it first opened because I had eaten at Maca, which was also under the superintendence of Chef Rishi Naleendra. At Maca, I thought that while the food was heavy handed–too salty, too charred–the chef was talented and required time to grow. Maca closed down 6 months or so after it opened. And very shortly after, Cheek by Jowl was set up in Feb 2016, taking over the space of Sorrel. The sudden and swift change from Maca to Cheek is faster than Superman getting out of his underwear. 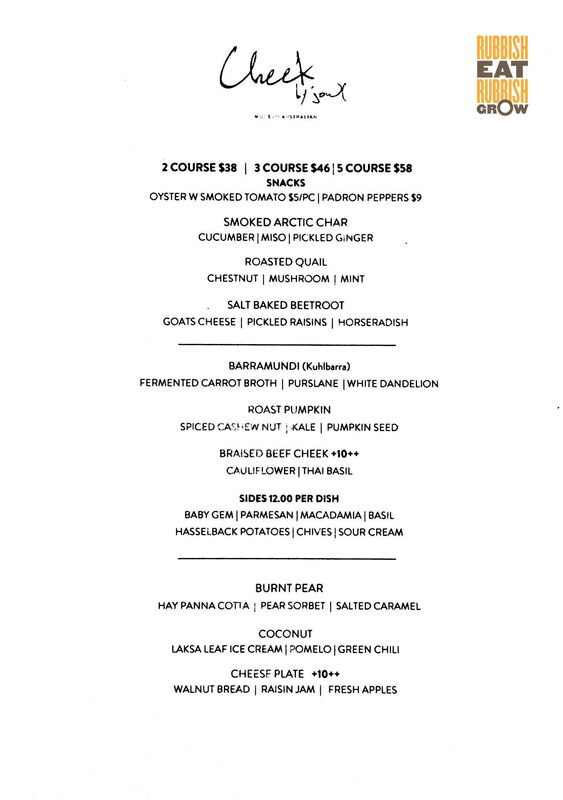 When Cheek by Jowl, which serves modern Australian cuisine, received its Michelin star, and since it was the only Michelin-starred restaurant in Singapore I had had not been, I decided to give the restaurant a chance. The second time eating Naleendra’s food confirms my initial hunch that he is indeed talented, but he still needs more experience. 2-, 3-, 5-course set lunches are priced at $38+, $46+, and $58+ respectively. Dinner: 2-, 3-, 5 courses at $68+, $78+, $88+. We were there for lunch and when we asked for a la carte menu, there was none. In any case, the pricing is rather reasonable. I also like that there are vegetarian options in each course. In fact, I think the vegetarian dishes are better than the meat. The service is particularly outstanding; efficient, polite, and friendly but not encroaching. We interacted with several service staff, and they can pull their own weight. A junior Asian waiter (Burmese? ), who knows his way around, is especially pleasant. The starters came and I noticed there was a marked improvement in Naleendra’s cooking. Here, they become more balanced. The smoked Arctic char is a rare dish to eat because Arctic char is one of the rarest fish species in Britain, found mainly in deep, cold, glacial lakes, or Nordic countries. It’s closely related to salmon, but the flesh is lighter and cleaner. Here, it is paired with cucumber, miso sauce, and pickled ginger. A light, inoffensive dish. The roasted quail is the best dish for the day. It is done beautifully with much depth and umami. The vegetarian option: the salt baked beetroot lies effortlessly on a bed of goat’s cheese, the earthiness toned down by the creaminess. While the starters are promising, the mains fall flat. The braised beef cheek (+$10 supplement) is tender but slightly gamy, and “The best thing among all the mains is the roasted cauliflower,” said my friend. Another friend lamented, “The roast pumpkin is so salty.” This is the vegetarian option for the main, and while it is true that it is salty at parts, I think it works because the sweetness of the pumpkin offsets the saltiness. The kale is also nicely sautéed to the point that it no longer has the disgusting bitterness I hate in kale. There is a hint of curry amidst it all. I stand by my word when I say vegetarian option is the safest bet at Cheeks. The desserts redeem the mains; they are excellent. The interesting coconut semifreddo, together with laksa leaf ice cream, pomelo, peanuts, and green chilli sauce, tastes like a cold version of laksa or tom yum. Burnt pear has a bitter salted caramel sauce, but is recovered quickly by the hay panna cotta. There is decidedly a marked improvement in Naleendra’s menu from Maca to Cheeks; there are certainly some sparks of brilliance here, not seen at Maca. I especially like how each protein dish comes with vegetables, providing a healthy meal. However, some residue faults (mainly, heavy-handedness and a lack of balance) from Maca remain. The food is bereft of finesse and confidence of a mature chef. The dishes we had that day were rather uneven; some good, some middling, and one terrible. It is always nice to give young chefs a chance, but young chefs shouldn’t be so anxious to strike out on their own, not when they are not ready, not when they are not steady. Naleendra still needs a few more years of experience to be great. You must be new to our site. We pay for almost all our food and blog with a clear conscience. We reject more than 95% of invitations. I wish your comment had come two days later. On Wed, we schedule an invited review which is damning.